QR codes have been a laughing-stock for years now. The gangly square bar codes were slapped on posters and magazine pages, and heralded as an easy way to open URLs or bonus content. Instead they became a frustrating symbol of over-engineering. You often needed a special QR code reader app which might fail to recognize the little robot tattoos on the first try. By the time you found your QR app and got a code scanned, you probably could have just typed in a URL. It became a joke worthy of HBO’s Silicon Valley: “Only Snapchat could make QR codes cool.” But it’s even funnier now because it has actually come true. Snapchat launched a feature called Snapcodes (also known as Snaptags). Each user now has their Snapchat-branded QR code on their profile that can be opened by pressing the yellow ghost icon atop the camera. If another user scans someone’s Snapcode by focusing their Snapchat app’s camera on it, they automatically follow that person. Now Snapchat tells me millions of Snapcodes are scanned each week. So to make it easier for celebrities, Snapchat Stories stars, and everyday users to get more followers on the app, Snapchat today begins allowing users to download vector versions of their Snapcode that they can put on websites, posters, big screens and more. Snapchat’s app doesn’t have a way for you to discover people to follow, but the downloadable Snapcodes could help interconnect its legions of users. The more people who follow each other, the more content that’s accessible to them in Snapchat, the longer they’ll use it, and the more opportunities the startup has to earn money. QR codes were originally invented by Denso Wave in 1994 to track cars being built on Japanese assembly lines. They caught on in Japan around 2002 in the pre-smartphone era when camera phones began to come with the ability to read the codes. Without modern apps or full keyboards, QR codes were convenient, automatic ways to open URLs, add a contact to your address book, or send a pre-defined message. But in the West, QR codes were slow to catch on. By the time they became common in the United States, people were starting to own smartphones that made the codes seem archaic. Microsites and URL shorteners made websites easier to type in manually. The lack of native support in iPhones and other popular handsets forced users to download sometimes-shoddy third-party QR apps. QR codes became a scarlet letter, outing brands as being out of touch with technology. At best, they were largely ignored. QRs were cemented as a joke by the “Pictures of People Scanning QR-codes” tumblr, which is empty. Yet in the past year, QR codes have made a comeback in the West. Apple displays a QR code on its new Apple Watch to help you sync it with your phone, and Facebook tried them as a way to join forums in its Rooms app. But it’s Snapchat that’s made them cool. In September 2014, Snapchat secretly acquired a QR code startup named Scan.me. We only found out about it, and the $50 million ($14 million in cash, $36 million in stock) because of the Sony Pictures email hack. Because Sony exec Michael Lynton is on the board of Snapchat, his leaked emails contained several important business proceedings of the company, including the acquisitions of Scan.me and eyewear computing startup Vergence Labs. 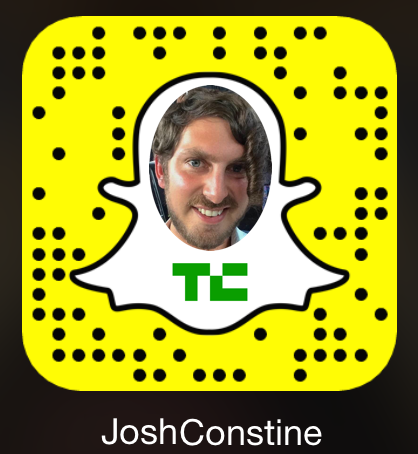 With Scan.me’s help, Snapchat devised the Snapcodes and launched them in January. Since then, people have started screenshotting theirs and using it as their Twitter profile picture, adding it to the blogs, and posting about it on social networks to convert their other audiences into Snapchat followers. When the app comes up in conversation, its common to see people whip out their Snapcodes and demand friends scan them so they can get more views for their Snapchat Stories. Now, Snapchat will let you download a vector version of your Snapcode that can be enlarged to any size while staying sharp and scannable. You can also customize your own Snapcode by adding graphics or text inside the white ghost, but any changes to the yellow background or black dots will make the code unscannable. Snapcodes are essentially Snapchat’s follow button. While Twitter and Facebook can make buttons you can just click to follow someone, Snapchat needed its own solution since it has no website and no links. Without them, the only way to follow someone was to manually type in their username. That’s kept connections on Snapchat feeling real, and prevented a few “Suggested Users” from dominating the community. Snapchat recommending people to follow like Facebook and Twitter do would go against its “this is your app, not ours” philosophy. Still, when you actively want to follow someone on Snapchat, making that easier could fill your app with fun content and make the app an even bigger platform for potent personalities. The same way Twitter handles and Facebook logos became a staple of advertising, I bet we’re going to see a ton of Snapcodes out in the wild. The Like button and the blue bird have a new neighbor: the yellow ghost.